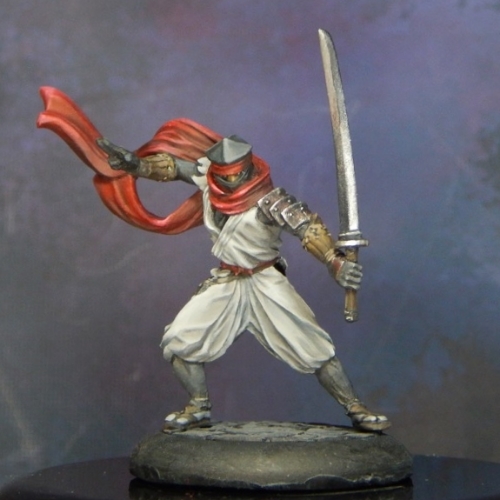 I finished my second miniature of the year: Anima Tactic's "Shinobi". I haven't successfully painted white clothing before, and this miniature was my attempt at off-white clothing using light grey as a midtone basecoat, then highlighting with Reaper's "Leather White" and putting the darkest shadows in the folds (but not too dark). I also played with shading bright reds with desaturated colors-- in this case, mixing red with a dark green for the shadows in his scarf. It's been awhile since I've painted anything in the TMM (True Metallic Metal) style, and I used P3 and Vallejo metallic paints for his upper arm guards, the kunai hanging from his belt, and his katana sword. However, I didn't exclusively use a few coats of the metallic paint. Instead, I applied the "shaded metallics" technique, blending parts of the reflected surfaces with increasingly darker glazes. This way, I controlled which parts shone brightly and which ones receded into a more matte surface. I'm still building upon the shaded metallics technique, and the time involved is somwhere in between basic TMM and NMM. While it takes a bit longer, I believe the results are an improvement upon the average metallic paint treatment. Some may even take it a step further and glaze surrounding colors into the metallic paints. While I initially wanted to add some snow effects to his base, I decided against it. While his robes currently read as "white", if I put bright white snow effects at his feet, his robes will look grey by comparison. I've now decided he's complete! In other news, just before I left for vacation, had a complete and utter meltdown about my hair. Long story kinda-short, I decided to add some dimensional color to my hair after 5 years of growing it out. I had a color consultation with my usual stylist and I made an appointment with her for my day off right before the vacation. What happened next was a perfect storm. The front desk messed up my appointment and had to fit me in with a brand new stylist. The woman with an appointment right before me arrived super-late and the stylist rushed through my coloring treatment to finish before the salon closed. I ended up with was, what I called, "acid-damage orange". I got home, looked in the mirror, and wept. It's all documented on Twitter and luckily I can look back on it and smile, knowing it was solved. I called out of work the next morning (I made up the time later that afternoon), went back the next day and politely, yet firmly, explained the situation. The same stylist agreed remedy the situation for free, admitting she "went too light" and over-extended herself, trying to manage two clients at once. In any case, I now know that I'm very emotional about my hair (everyone perfectionist has some vanity) and I'm pleased with the results. Life can now go on. Once that nightmare was over, I went on vacation, with perfect beach hair, and it was glorious. I haven't been on vacation in over three years and this totally made up for it. I read a 500+ page fantasy novel in record time as I lied on the beach, sipped on tropical cocktails, and soaked up the sun while a perfect breeze and the relaxing sound of waves rolled off the ocean. I want to go back! It was stupid-amazing. Coming back to reality is rough. Everyone's so uptight and rushing to get places. I just want to shout, "Slow down, everyone! It's not that important. Just enjoy life." I'm sure that will fade, just like my tan, but in the meantime, I'm riding the post-vacation high as long as I can. On a convention-related note, I was hoping to make it to LVO, the Las Vegas Open. However, knowing I just took off an entire week from work and spent all my money on the vacation, I'm not sure it's in the cards for me this time. I regret this very much, especially since I have friends who I could stay with rather than staying at a hotel. In any case, I'll know for sure after I check flight prices and see which classes are still open. I couldn't commit to anything before I came back from vacation, and it's frankly not looking very good. I'll think more on it tonight as I unpack and get ready to paint some miniatures before I have to go back to work. I'm looking forward to some quality time with my 75mm steampunk miniature!